If you’ve seen the new Borderlands teaser trailer you might have spotted that there’s a code hidden in all that deliriously exciting footage. If you haven’t, then don’t worry, I‘ve done all the hard work for you and have found as much of this mysterious Borderlands 3 code as I can! In total there are 25 digits hidden throughout the video, reading C35TB-WS6ST-TXBRK-TTTJT-JJH6H. Yep, that's right: it's a Shift code, which gets you some free loot! 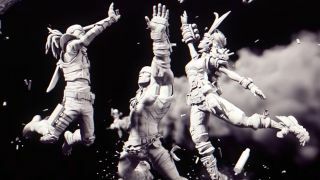 The first section is found on a pipe behind a Psycho statue, the second is next to a Midget statue above them, the third is on the flying car piloted by the four playable Vault Hunters (who you can read more about in my Borderlands teaser trailer breakdown piece), one is on the wing of a plane, and the last one is just above Ellie. Just glance below to see what goodies await, or watch the video to see the other secrets I found! "Thank you for being excited enough to dissect the new bandit mask with the grace of Dr. Zed! As a reward, you have been granted Salvador's Community Day skin and 5 Golden Keys! There are more skins to be granted, so good luck out there, Vault Hunter!" You'll almost definitely be able to see some more Borderlands goodness during Gearbox’s PAX stream that kicks off tomorrow at 6pm GMT / 2pm EDT / 11am EDT. If it is a Shift Code then I really hope it'll unlock a special new skin to celebrate the announcement of Borderlands 3, and I really, really hope that the skin hints as to what happened to the four Vault Hunters (six, if you count Gaige and Krieg, which you totally should) after the events of Borderlands 2. Please. Want more FPS goodness now that Borderlands 3 has been announced? Here’s the best FPS games you can play if all this talk of Borderlands 3 has got you thirsting to return to a stellar shooter!